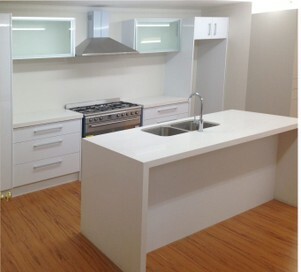 Brand New modular kitchen, NZ made. Front doors/drawers and end panels are in HIGH GLOSS LACQUER finish. 2 Wall Cabinets' front are flap-up aluminium framed glass. 50mm thick Engineering Stone bench top, Island with double side waterfall ends. Each end edge clashed. S/S 2 bowl under-mount sink inserted. Hafele 2 x 15L bins mounted. Slim square handles, all cabinets are fully assembled. All drawer runners and door hinges are soft close. Front colour: Lacquer High Gloss White. Bench top colour: Ice Snow (White with little patterns) Price vary with different colors. It includes 5 base units, 3 wall units, 1 tall units and space for Freestanding Oven.